The Verizon LTE910CF v11.00 Common Footprint (CF) Socket Modem are LTE Category M1 Carrier end device certified 4G cellular modems. They utilize the Telit ME910C1-NA module as their cellular engine. The LTE910CF 11.00 units operate in LTE band (B13). End device certification allows users to implement the LTE910CF in their devices with no further North American carrier certification requirements. 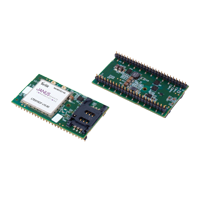 LTE910CF modems are pin compatible with the full line of Janus CF Socket Modem Products.